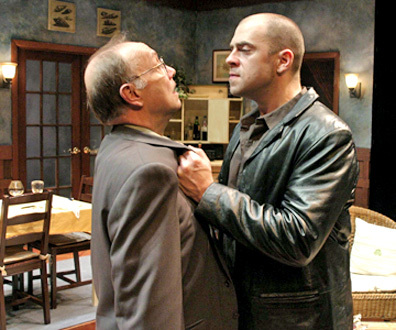 The weather outside may be icy, but at Lyric Stage the heat is on, via a blistering performance by Timothy John Smith. The play is "Groundswell," Ian Bruce's 90 minute dramatic thriller set in post apartheid South Africa. The story is about diamond mines, political injustice, missed opportunities and the struggles people endure to survive. Thami, a black man, is the gardener and off-season manager at a remote, seaside guest house. He longs for a better life, and to be reunited with his family, currently living in squalor in Cape Town. His friend, if you can call him that, is Johan, a commercial diver and handyman living in a guest shack. He's a former cop who went to prison for manslaughter, and now he's got a plot to make them both rich. They'd like to take over an abandoned diamond mine being sold off by the government. Johan's plan centers on Mr. Smith, the hotel's lone guest, a retired banker, and supposedly well off. If, over a carefully planned dinner, he can persuade the gentlemen to invest in their property, everybody can hit the jackpot. The deceptively casual dinner conversation starts off innocently enough. However the prospect of securing an investment goes awry as Johan (Timothy John Smith, at left in the leather jacket) begins to drink. The more he consumes, the more belligerent he grows, until a monster emerges. And as fiery as Johan grows, so Smith (Richard McElvain) shrinks and shudders, soon fearing for his safety and ultimately, his life. There's plenty of potential in Bruce's script, and a good deal of it plays out. But it also has its shortcomings. The beginning of the story, which should entice, is far too dry. You do have to listen carefully to get on board with the South African accents, but beyond that, Bruce's writing meanders without saying enough. The play only comes to life when Johan exposes his darker side through liquor, which he consumes with abandon. The other puzzler is a plot point that, to me anyway, appeared to be an opportunity missed. As Johan attempts to threaten Smith into investing in the mine acquisition, he uses Thami's downtrodden life situation to shame Smith for his own prosperity. He's told he's as bad as the government, taking advantage of poor workers to amass a fortune. He wants him to make up for the slights Thami and his family have endured at the hands of the hierarchy. He demands redemption. However, Johan plans to be an equal partner in this venture and stands to profit handsomely. The way Bruce plots the story, the banker does eventually explode and defend himself, but for his own reasons. Would it not be more dramatic if, in this brutal cat and mouse game, Smith also found the strength to turn the tables and accuse Johan of using Thami's situation for his own greed? If Johan is pleading Thami's case to right a serious wrong, why is he standing there with his hand out as well? The truth is that he's been pretty battered by life himself, a lot of of it at his own hand. But now, just as he's accusing Smith of feeding off the blood of the poor, he's abusing his relationship with Thami purely for his own gain. This provides tremendous insight into his character, a fact that could have been thrust into the spotlight more deliberately if Smith flipped the conversation, called him on his brazen self-interest and let him have it with both barrels. As it stands, Johan is a pathetic bully. If he were really cut down to size by Smith, the audience might experience a collective sigh of relief that the monster had been defeated at his own game, and by his own prey. The story would end the same way, but the arc might be more interesting. As Thami, Jason Bowen delivers a gentle man who remains patient even as he longs to turn his life around. Richard McElvain, as Smith, does a nice job as the privileged banker with some quirky mannerisms, but he's saddled with a speech or two that come off as somewhat preachy. And then there's Timothy John Smith, who's frightening as the ominous and morally corrupt Johan. He stalks and taunts and presents himself as a menacing brick wall that allows no one to pass. Ultimately, we see three troubled men who've been battered about by their government, although each in a different way. And at the final blackout, their struggles go on. "Groundswell" is at Lyric Stage Company of Boston, 140 Clarendon Street, through January 30. For information, call 617-585-5678.